A picture book series with touch-and-feel tabs. Transportation books for children are popular for a reason: Young children just love spotting and identifying these exciting vehicles. DK's Feel and Find Fun: Building Site is full of construction vehicle pictures and names for the big-machine lover in your home. 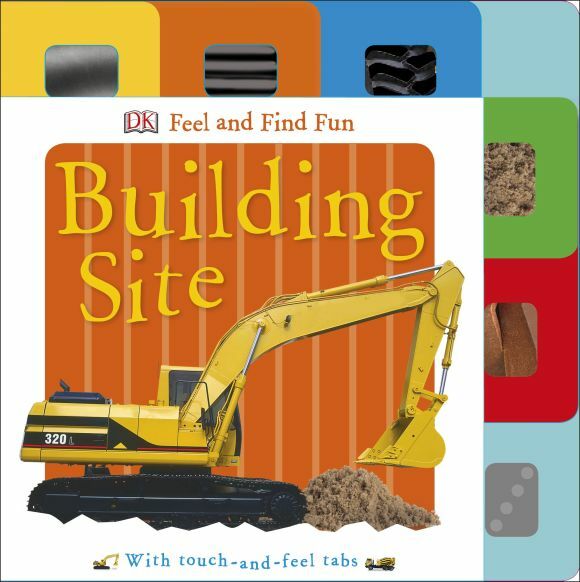 From diggers and dumpers to cranes and cement mixers, this early-learning title features unique tactile tabs to encourage exploration, and fosters word recognition, manual dexterity, and parent-child interaction and early language skills. Toddlers will love touching the textured tabs and matching them to the larger tactiles on each spread in this series of books. The sturdy tab books are immediately appealing, with a variety of textures around the front cover. Every spread has a textured tab that preschoolers will find easier to grasp and feel, plus more touch-and-feel elements to explore on the page. Large-type word labels and simple text encourage word recognition, too. With lots to explore with eyes, fingers, and minds, DK's Feel and Find Fun touch and feel books are just right for toddlers.